It is rare indeed for a leader to have the attributes of humility, loyalty and honesty and to be an effective leader but such a man was Kumaraswamy Kamaraj, a former chief minister of Tamil Nadu – formerly known as Madras state – and subsequently a key advisor to Jawaharlal Nehru. He was a man with limited formal education who rose from humble beginnings to the pinnacle of power such that he was at one time viewed as the “king maker” in India. His humility and loyalty came to my attention through an anecdote about Kamaraj related to me by my first cousin, Dr Alexander Joseph, who was a young teenager when it occurred. It is the type of story that I love ………… and the fact that it involved my maternal grandmother made it all the more appealing. But first by way of introduction………..
My grandfather, Barrister George Joseph, was active in the freedom movement in India through the 1920s’ and 30s’. He was one of the most prominent South Indians involved in the movement and certainly the most prominent Kerala Christian. He was intimately involved with some of the giants of the movement – Gandhi, Nehru, Jinnah, Vallabhai Patel, etc – and was jailed by the British with some of these individuals for his agitation against colonial rule. He is mentioned in Nehru’s autobiography and my brother, George Gheverghese Joseph, wrote a biography of our grandfather – “George Joseph: The Life And Times Of A Kerala Christian Nationalist” – which has been well received. His premature death in 1938 resulted in his role in the freedom movement not being given the recognition that it deserves. My grandfather, who practised as a barrister in Madurai, was intimately involved with Gandhi who stayed at his house in Madurai on several occasions. He was introduced to Gandhi by Rajaji (C. Rajagopalachari) in 1919. 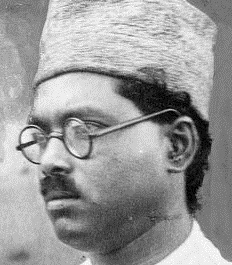 The relationship between George Joseph and Gandhi was one that lasted to his death in 1938 – although there were issues on which they vehemently disagreed. The role that George Joseph played in the acquittal of Kamaraj in the Virudhunagar case cemented an already close relationship between the two men. “Importantly his (Kamraj’s)approach to governance and party control was never tainted with religious overtones and a secular commitment was natural and integral to his mission in life. Among his cherished political mentors, Kamaraj held George Joseph, a Kerala Christian nationalist who chose Madurai as his base for practising law and for his political activities, in high esteem. Fast forward to the early sixties: George Joseph was long deceased but Kamaraj had risen on the scene both in Tamil Nadu and nationally. In 1954 he became Chief Minister of what was then Madras state. George and Susannah Joseph’s son, Moncy Joseph, was residing and working in Madurai. In the early sixties Susannah Joseph was visiting with her son and daughter-in-law at their modest home in Madurai. Kamaraj had somehow come to hear that she was visiting Madurai and one fine morning around 7 am, Kamaraj turned up at the house in his car. He was escorted by a fleet of vehicles including police cars and security which, of course, attracted the attention of others in the neighborhood and caused something of a sensation that the Chief Minister was visiting a local home. He had come to pay his respects to Susannah – the wife of his mentor, George Joseph although it had been around 25 years since his death. He entered the house and in a typical display of his simplicity and humility, he, the chief minister of a major state in India, bent and touched her feet to the surprise of my grandmother and other family members. He told my grandmother that if ever there was anything she needed she should let him know. My grandmother, later said that during the time that my grandfather was alive, she had entertained everyone from royalty to the most ordinary of people but that Kamaraj, who had risen from humble beginnings to his position of prominence and power, was one of the few people who ever showed the type of attention and deference that he did to her. I had read a lot about Kamaraj and his basic humility and lack of pretensions even as he achieved greater prominence and power and this story affirmed for me the essence of these qualities. Kamaraj went on to even greater prominence on the national scene. Nehru opined that Tamil Nadu, under Kamaraj, was the best administered state in India and felt that a man with his talents was being under-utilized as chief minister of a state and asked him to come to Delhi to assist him. He did so and in time became the architect of the “Kamaraj Plan” – a scheme to revitalize Congress, though cynics claimed it was a plan to ensure that the Nehru dynasty prevailed after his passing! After the death of Nehru, Kamaraj played a key role in the elevation of Lal Bahadur Shastri and later Indira Gandhi to the position of prime minster. 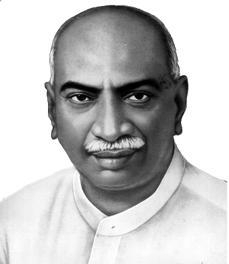 Kamaraj came to be known as the “king-maker”. He never sought the prime minister’s office for himself – this was, in part, his lack of personal ambition but also his basic pragmatism that caused him to realize that as a South Indian who spoke neither Hindi nor English fluently, the country would not be inclined to accept him as prime minister. Although he was instrumental in the elevation of Indira Gandhi to prime minister, it was something that he came to regret later after she fell out with Kamaraj and other veteran Congress leaders who came to be known as “Old Guard”. In yet another demonstration of his loyalty and gratitude to Barrister George Joseph, Kamaraj was instrumental in having a statue commissioned of his mentor in 1966, at Yanaikkal junction in Madurai. 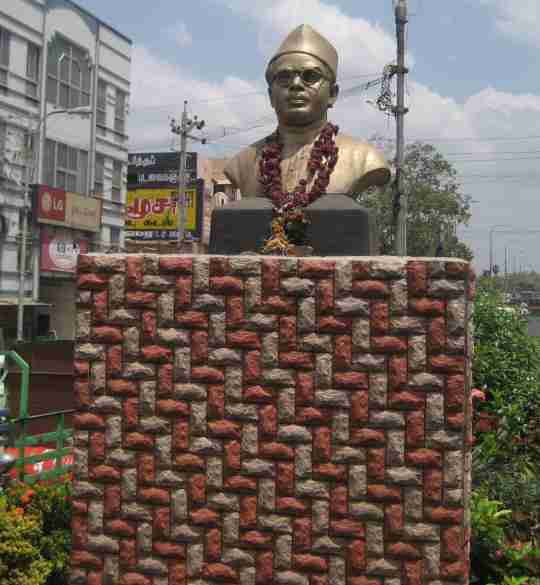 It was unveiled by the then Home Minister P. Kakkan and faces a similar statue of Gandhi.